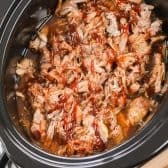 Dr. Pepper Slow Cooker Pulled Pork is the perfect way to serve a crowd. It’s easy, tender, delicious and everyone always loves it! Place the onion in the bottom of the slow cooker. Rub the outside of the roast with salt, pepper and garlic powder. Pour the Dr. Pepper over the pork and cook on high 4-5 hours or on low 7-8 hours. The meat will be very tender. Using 2 forks, shred the pork and place back in the juices. Add barbecue sauce to taste. Allow to cook an additional 30-60 minutes if desired. Serve on crusty rolls with coleslaw. If your pork produces a lot of juice you might like to remove some before adding the shredded pork back into the mixture. Nutrition information does not include rolls.